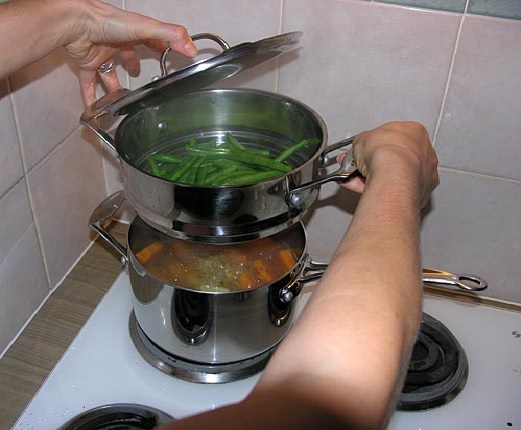 Boiling and steaming is an easy way of cooking veggies without any fat. Boiled veggies are usually soggy as their nutritional value can be lost along with their taste. Unlike boiled veggies, steamed ones taste much better as their natural goodness remains. In addition, steaming allows you to achieve any texture from tender to crispy. There are many ways of steaming veggies but using a steaming basket is the simplest method. A steaming basket is a specialised holder that is made of steel with holes at the base. Even if you do not have a steaming basket you can always use a heat resistant colander instead. With an inch of water at the bottom of the sauce pan covered with a steaming basket/colander at the top you can easily steam veggies in the simplest possible way. First boil some water in a saucepan. Now as the water starts boiling cover the saucepan with a steaming basket or colander. Next add all the veggies in the steaming basket or colander and cover it with a lid and leave them for a while. Keep on checking the veggies. As soon as the desired texture is achieved take them off the steam. For a crisp texture let them steam for 3 to 4 minutes otherwise steam for 5 minutes if you want them tender. Once the desired texture is achieved take them out in a serving platter. Finally top them with some seasoning to taste and serve hot.